Four page full colour brochures, professionally prepared with 3D floorplans on all Sales properties. Also a virtual tour of your property is provided as standard. Philip has spent well over 20 years in estate agency, commencing back in 1981 with a family-run business in his native Kent and then with a national corporate chain before branching off into other property-related business areas. 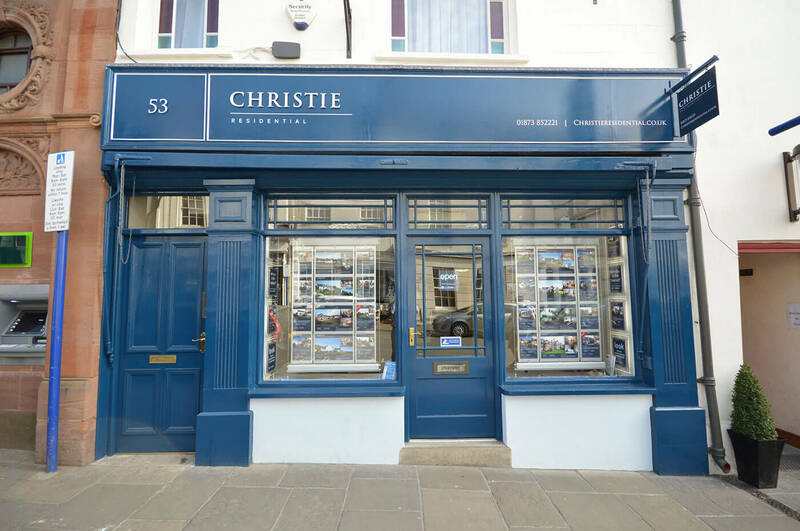 In 2004 Philip returned to front-line estate agency and set up Surehomes Estate Agents in Abergavenny before rebranding to Christie Residential in 2014. With the core values of providing straightforward, honest advice allied to integrity, Philip and his team are passionate about helping people navigate the onerous task of moving home with the minimum of fuss. Whilst sport, music & good food all feature in Philip’s life away from work, they are all very much second place in the pecking order behind spending quality time with his teenage daughter Megan and grown-up son, Jordan. Brychan has worked in the industry since 2002, cutting his teeth in a busy estate agency in North West London before moving back to Wales, taking up his role with the company as Sales Manager in August 2010. He has a professional ethos based on hard work and professionalism, and a belief that estate agency is above all about people. Brychan was promoted to Branch Manager in 2015. He spends his spare time with his family, wife Rhian and sons Gruff and Elis. He is a failed musician with a highest chart position of 127 and currently plays bass with his band, Burning Ferns. Mike has worked in Estate Agency for over 15 years. Having started his career in Cardiff, he has gained extensive and varied experience having been Branch Manager for both large corporate and independent estate agents in England before returning home to Wales. Mike would describe himself as a people person who thoroughly enjoys his work. Outside of work Mike is kept busy by his wife, two children and dog. When allowed some time to himself, he is most likely to be found with a book in his hand and or a cheeky glass of red wine. Emma has been a member of the team since March 2014, having previously worked for 6 years for a Letting Agent in Merthyr Tydfil. Her role is to oversee the smooth running of our Lettings Department and liaise with our prospective tenants. She lives with her partner, Steve in Abergavenny, and they have four teenage children. As a family they enjoy camping and spending family holidays in Cornwall, bodyboarding, crabbing and playing cards. She has also recently discovered the challenges of running and swimming and cycling. Beverley is the latest addition to our tight knit team. Beverley has recently returned to her native Wales after spending many years in South Africa. Beverley has more than 10 years’ experience in real estate under her belt, she is passionate about property, prides herself on her communication skills, attention to detail, commitment to superior customer service and is very keen to get involved in the property market in Wales. Family is what Beverley is about and she has relocated to Wales alongside her daughters Kim and Jade and grandchildren Dylan and Isla. Lucy has been with the company since 2009 and in total has been working in estate agency since leaving school. In her role as Property Administrator, Lucy provides vital support to both the Sales and Lettings Departments. Lucy would like to think of herself as an organized, hardworking member of the team. Happily engaged to Damian, with a young son, Ioan and expecting their second child this summer. During Lucy’s spare time she spends it with her family, whether that’s going on adventures or chasing her son around a play centre!